Max Mara is one of those trusted Italian brands that never lets us down, nor the teeming throng of shoppers that pass through its 2,300 stores each year. With deep roots in no-nonsense outerwear, we always get a perfectly cut camel hair coat, or a well-proportioned tweed tailleur. This season we got all that plus a whole lot more as Max Mara strode confidently down a route filled with unexpected twists and applauding turns.The collection was based on the brand's trusted wools, tweeds and cashmere but new voluminous, elongated silhouettes and patchwork constructions shifted the eye completely. 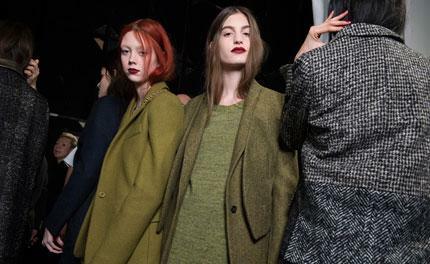 The fronts of cocoon-like coats, wool column skirts and mohair sweaters, for example, were conceived in mannish wools, while the backs revealed gilded gold crocodile embossed panels. The mix of opulence and sobriety was perfectly judged and was threaded throughout the collection in low-heeled gold booties and collars on coats. There was plenty of covetable outerwear here, especially the wool panelled puffer coats and mushrooming shaved shearling coats printed in two-tone check patterns. Max Mara completed this beautifully conceived collection with the new evening suit cut from ultra-fine wools on the front and daring edgy PVC from behind.